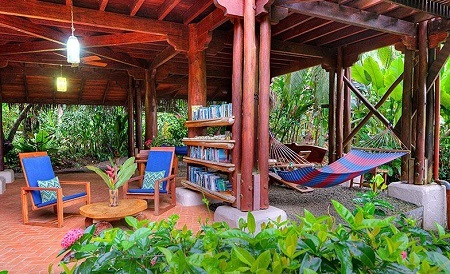 Luxury Playa Nicuesa Rainforest Eco Lodge on the Osa Peninsula - Reachable only by boat - Golfo Dulce Region, Costa Rica! Bid Per Room Per Night and Stay Two (2) Nights! on the Osa Peninsula - Golfo Dulce Region, Costa Rica! • use of kayaks, snorkeling and fishing equipment. Immersed in the rainforest and fronted by calm gulf waters off the Pacific Ocean, Playa Nicuesa lives in harmony with nature. Reachable only by boat, let your truly natural vacation adventure begin. Arrive in the naturally beautiful Osa Peninsula, and let your vacation adventure begin as you board our private boat and make your way to our eco-friendly lodge. Dramatic views of the mountains along the Pacific Coast, and surrounded by the verdant rainforest for thousands of acres welcome you as you approach. Jade colored water, dolphins, majestic blue butterflies and leaves as big as elephant ears soothe your senses. Sustainably designed and constructed, this unique adventure retreat harnesses natural energy from the sun and operates with minimal impact on the environment while ensuring guests enjoy eco-friendly lodges. 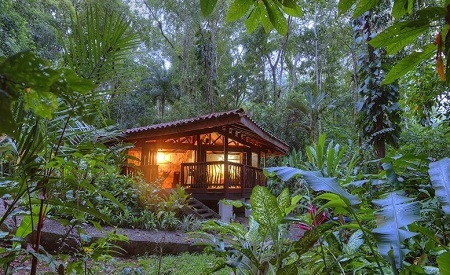 Enjoy the uniquely and beautifully designed main lodge overlooking the rainforest or relax in your private jungle cabin. Freshly caught fish, locally grown vegetables, and tropical fruit create an authentic Costa Rican culinary experience at our tree-house style restaurant overlooking the lush canopy of trees. When it's time to explore, our resident naturalist guides will lead you on rainforest hikes, kayak snorkeling and paddle board excursions, dolphin tours and fishing trips. 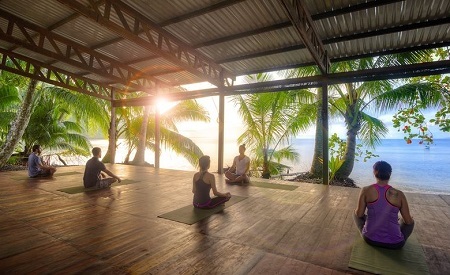 For calm and serenity, enjoy yoga classes and massage/wellness treatments in our tranquil hideaway. Or, explore on your own. Trek along trails that wind through our 165-acre preserve. Enjoy unlimited use of hiking and fishing, snorkeling, paddle boarding and kayaking gear. Come discover a Costa Rica retreat where adventure, conservation, and relaxation live in perfect balance. Reachable only by boat….a truly natural experience awaits you! Offer is based on single or double occupancy in a Regular Rooms. Join in on the daily tour at no charge and get an inside glimpse into the ecofriendly construction and operations that has earned Playa Nicuesa the highest sustainability certification awarded by the Costa Rican government for the past 5 years. We will meet you at Golfito or Puerto Jimenez Airports and take you to the Lodge. Fresh, Local Dining - Guests dine together at big beautifully hand carved wood dining table. Stay 2 Nights as desired and based on availability. Bid Price is Per Person.